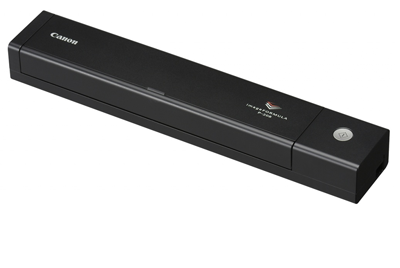 Canon imageFORMULA P-208II: the ultra-compact, productive scanner for mobile or home users. The tiny P-208II delivers impressive double-sided scanning speeds of up to 16ipm. The integrated 10-sheet ADF enables batch scanning for extra productivity: perfect for scanning contracts and associated documents. You can travel light with the P-208II as it has a footprint that's a little larger than a standard ruler and weighs only 600g. Powered directly via USB, it helps you maintain a high work rate anywhere in the home or on the road. The stylish, compact and ultra-lightweight P-208II provides true plug-and-scan convenience. With CaptureOnTouch Lite built in, and no additional software or drivers to download, you can simply connect, scan and go. Scanning functions and an improved icon-based user interface mean you will enjoy an even more intuitive scanning experience. An extended choice of plug-ins for SugarSync, OneDrive and Dropbox, alongside Google Drive™, Evernote and SharePoint, make it easy to work with your favourite software tools. The P-208II can scan a variety of media, from A4 to irregular-sized documents like embossed card, so it’s perfect for mobile users. Get organised at home and make space by scanning your household bills; or preserve your memories digitally by scanning your old photos in high quality, using a special feature that reproduces images as close to their originals as possible. The P-208II’s range of image processing features includes auto colour detection, text orientation recognition and text enhancement – to deliver high quality images and save valuable time. For convenient and intuitive scanning, use the Full Auto Mode feature that automatically applies the best settings for your document. Simply load up your documents and scan! For the freedom to scan wherever you are, combine the P-208II with the optional WU10 Wi-Fi and battery unit. Use it to wirelessly scan documents directly to your smartphone, tablet or desktop PC, or share the scanner amongst a group of users or devices via a network server or home router. The powerful CaptureOnTouch mobile app gives you the flexibility to scan direct to your iPhone®, iPad® or Android device. Save valuable time with double-sided one-pass document scanning. This free app is available for both iOS and Android devices.